Right, I know that the aim of home cooking is not to replicate the flavours of processed food. But sometimes it is right? You know when you find a product you really like, and you manage to recreate that in to a somewhat healthy manner? Well that is a big victory in my book. I remember when I followed Slimming World I loved finding a way to make a “bold” dish from scratch. All of the taste without the guilt or breaking your diet plan. Well this, my friends, is something along those lines. I am a huge fan of pasta bake. I like a lot of different sauces. I’ve tried the Aldi and Lidl versions and really enjoyed both. The most popular one seems to be the Dolmio one though. It’s thick, it’s cheesy, and it’s a fabulous orange colour. It’s a lovely sauce. 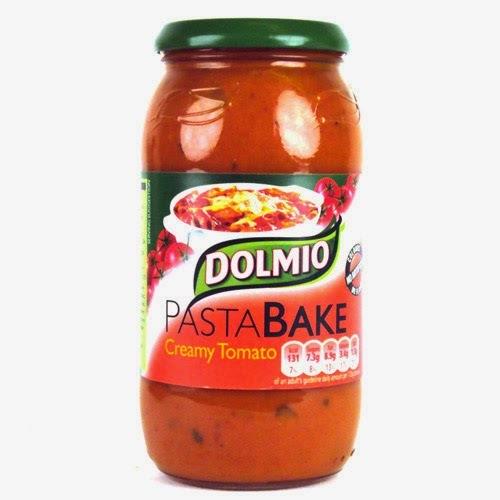 Now, I in now way mean to offend the lovely people at Dolmio, but I often wondered if it might be possible to create a similar-tasting sauce from scratch. Something healthier, less processed, and cheaper. And this is where this story began. It was a cold March Saturday, and my lovely teenage cousin was coming over to babysit Billy as it was Peter’s 30th birthday party that night. Myself and Peter were meeting his parents for a meal before the party so my cousin would be babysitting Billy from about six in the evening. For this reason I wanted to leave her some dinner. She happens to love pasta bake. So, I text Peter (who was in Nutgrove shopping centre with Billy) and asked him to pick up the Dolmio pasta bake sauce. Sadly though, he was already almost home. He offered to stop at a different shop (this is riveting stuff isn’t it?) and I said “no, feck it, I’m going to make it myself”. And that I did. I put my little chefy thinking hat on, had a look in the fridge, and began my experiment. I’ve actually been doing this a lot lately – messing around in the kitchen trying new recipes and generally making a huge mess. The next morning the following conversation happened. Cousin : “No way. It was really nice”. So there we have it, a big thumbs up from the lady herself. She likes pasta bake more than anyone I know, and if she didn’t notice that it wasn’t the usual jarred sauce then I don’t think anyone will. So, give it a bash and let me know how you get on. It’s got all the flavour, and it’s not full of crap. I’m quite proud of this one. 1. Chop the onion, garlic, and red pepper. Add to a frying pan with the olive oil and saute until everything is nice and soft. 3. Add the tin of chopped tomatoes and season with salt, pepper and whatever herbs and seasoning you enjoy. 4. Using a hand blender, blitz everything until a thick orangey sauce is formed. Add the cheddar cheese and stir in the cream cheese. This is now essentially the sauce. 5. Fry the chicken, bacon or whatever meat you wish to use (or not). 6. Add the meat (and sweetcorn in my case) to the sauce and allow to simmer for about five minutes (the meat juices all add flavour). 7. In a pot boil and cook the pasta as per packet directions. 8. Drain the pasta when Al Dente (soft with a bite) and add the sauce mixture to the pasta, mixing well. 9. Serve on a white plate (just because) and sprinkle on some cheddar cheese and black pepper just before serving. Oh delicious!! I have everything apart from the philadelphia, must try this out!! very nice and easy recipe to try thank you for sharing .. i will try to get this sauce.